When living in a space as tiny as a campervan, proper storage is a must! There are a lot of creative ways out there to keep your van living space more organized. We’ve pulled together a collection of ideas to make the most of your storage space and added a few tips as well. Take advantage of pop-up hinges and hidden shelving. If you have to have a large door on a cabinet, think of ways to double its use as a surface. We used these spring loaded hinges on our van to build swing out shelving into our side doors! They are sturdy enough to cut vegetables and cook on – plus they give us a ton of extra table space. One thing we often hear people complain about is items sliding around inside of their large cabinets. By using multiple smaller bins you’re going to reduce the road noise and keep things more organized. We like using plastic or fabric bins like these because it allows us to take a section of items (like cooking gear) out to the campfire without having to hassle with digging everything out separately. Not having enough space to pull things out and set things down is one of the biggest challenges of van life. 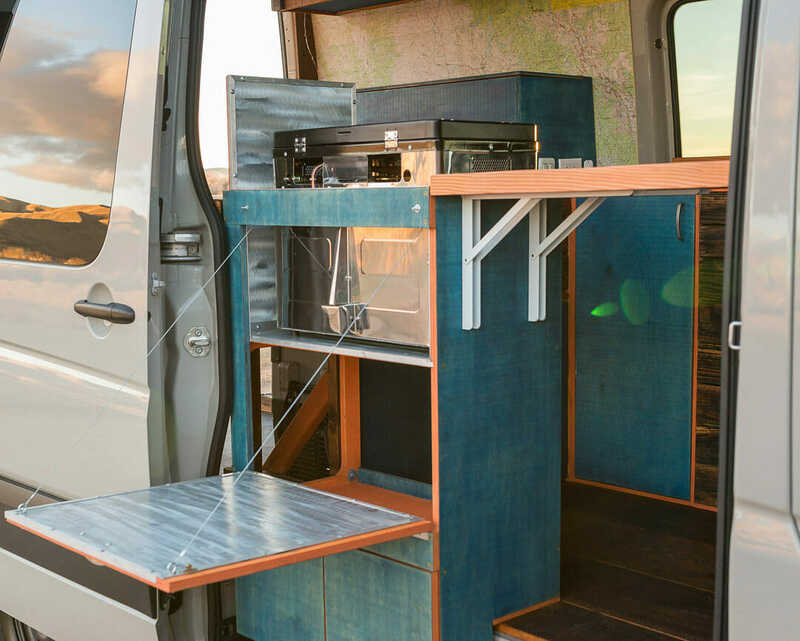 Expose yourself to a bunch of different van life layouts on Instagram or other websites to come up with ways to build extra table space into your vehicle. Many swivel options, such as the Lagun table frame, can be found in the marine world. Make use of magnets and bungee cords to keep things tied down. The last thing you want when you’re driving around is a bunch of items sliding back and forth in the vehicle. We like using these magnetic spice racks to keep these items off the counter but within reach. Even though the doors may be thin, often you can still use them to hang items like travel bags or tools. Double up on functionality. We combined portable seating with a garbage can. You can also use a hollow seat to hold towels, dirty laundry, or other knick knacks. Take it a step further and hide a portable toilet beneath a more comfortable chair. Or use you’re 12v refrigerator as a solid surface or extra seating as well. As you build out your van, you might find there are tight or awkward corners. Don’t let this space go to waste! There are a lot of little jars or other items that will fit perfectly. Without a doubt, adding a desk or a table to the inside of a van can be the biggest waste of space. While some digital nomads need an entire mobile office, others can get away with a little less. First, decide if you actually need a table in your van. Portable tables that you can set outside make a great alternative. Consider installing a telescoping table base that you can drop beneath the bed. Or, take advantage of a swivel seat and hidden desk. Muddy boots and shoes are an annoying thing to trip over, especially when it’s raining. This is something we hadn’t even thought about when we left, but it’s certainly something to consider. Bulky, lose items take up a lot of surface area so ideally anything that you plan on tossing around (like dirty laundry) should have an area sectioned off. Whether inside or outside of the vehicle, having some heavy duty drawer sliders can add a lot of organization space. With the right sliders, you can store bikes in the back or even an entire kitchen set up. Not everyone wants to (or needs to) camp stealth. If you’re planning on adventure camping rather than staying in the city, consider taking advantage of the outside of the vehicle for storage. A roof rack or storage cabinets off the back of the van are a good place to store bulky items like propane tanks, water or spare tires. Do you have any organization or space saving tips? Drop them in the comments below! I’m planning to buy a ProMaster van and converting it. I’m a veteran and have to drive six hours to the nearest VA hospital. Trying to find a hotel room at a rate I can afford is near impossible. I need to carry a Breathing machine and lots of pillows because of my PTSD, fibromyalgia and Insomnia. A van just makes sense.